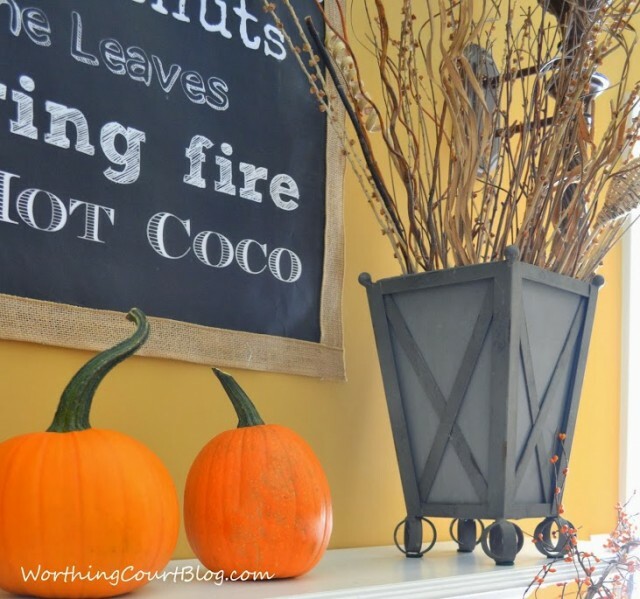 UPDATE: Enjoy this free fall printable that I used in a project at my previous home. We’ve moved into a new-to-us home and I’m having so much fun changing my style! 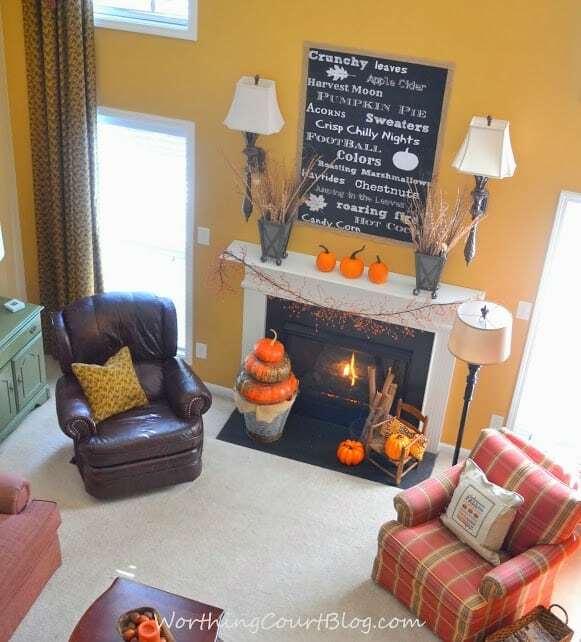 Click HERE to see more about the total remodel that we’re giving to our new home. You’ve probably figured out by now that this isn’t a real chalkboard. 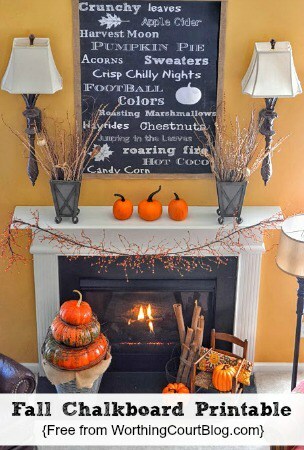 When I decided that I wanted a chalkboard above the fireplace for fall, I considered doing the real-deal chalkboard art. Even though I’m no good at freehand chalkboard art, I knew that I could get a great result using the same method that I used for the chalkboard that is part of my typography gallery wall. 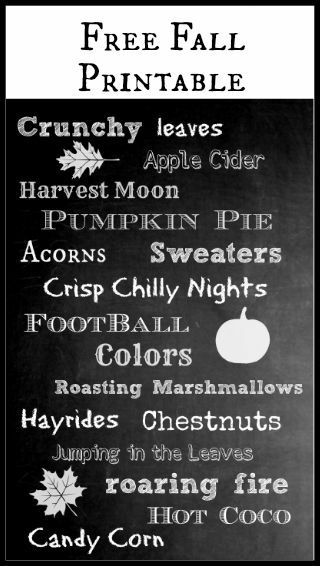 In case you missed it, you can find out the easy way to get perfect chalkboard art by clicking HERE. But I decided against the real-deal because I just didn’t have the time that it would take to create something so large – this one measures 36″ x 48″. I needed something large because the fireplace wall in my house is two stories tall. So here’s the big secret – it’s just a printable that I created and then took to Staples and had printed out as an engineering print. For less than $7. Yes, you read that right – less than $7 for a 36″ x 48″ piece of art. Bam. And I want to share it with all of you! Simply click on the link above each one to download the size that you want. BTW – I know that the ‘a’ is missing at the end of ‘coco’, but I did that on purpose. I guess I thought that it looked kind of cutesy that way. This size is an Adobe file. If you want to have a large engineering print made, you’ll need to download it to a thumb drive. Take the thumb drive to your local printing place to get the size that you want printed. This size is a file that you can download and then print on your home printer. One more tidbit before I go. When I attached the print to the wall (using 3M Velcro strips), it was looking a little plain. To give it the appearance of being a framed chalkboard, I “framed” it with burlap ribbon that I glued along the edges of the poster (not the wall!) with a glue stick. Make sure you allow the glue to dry before you hang it or it might just fall right off. I encourage you to give it a try. It was so easy to do and makes quite the statement. 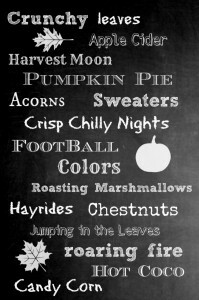 No mistaking what season it is in my house! What a great idea and so affordable! How nice of you to share it with us as a freebie!! It’s beautiful! Thanks so much for sharing it! It’s great! Really sweet of you to share…thanks, Suzy! This is such a fabulous project, Suzy! I hope it goes viral! I’m certainly pinning and sharing on my fb page. I used an engineering print for our family window picture in the kitchen and I love it! Thanks for sharing! Love this idea! Never even thought of that! That is such a cool idea, Suzy! Question, was it created with a white background (like in Word) and then printed on black paper? LOVE it! What a great idea! 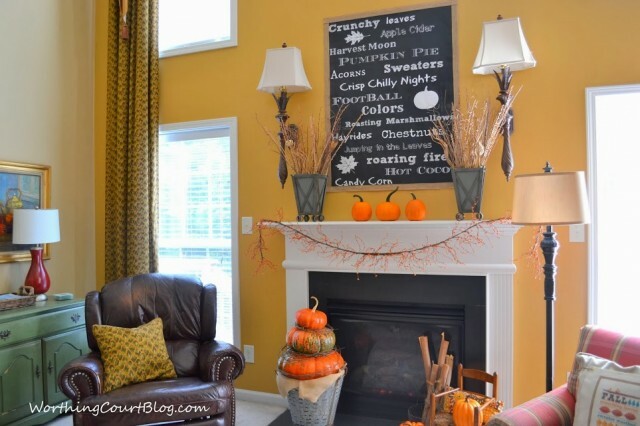 I have a large area over my fireplace too and I’m already thinking past Christmas decorating…. Wonder where I could print this…no Staples anywhere here. If you have any ideas, send them on! Hi Susan. Office Depot also does engineering prints, although the one that I checked with can only print up to 24″ wide. Others may be able to print wider. FedEx Office (formerly know as Kinkos) does them too, but I don’t know what their size limitations are. If you don’t have either of those near you, I would imagine that most any office supply store would offer this service. Wonderful!! We do have Office Depot. I’m going to try this, thank you very much! 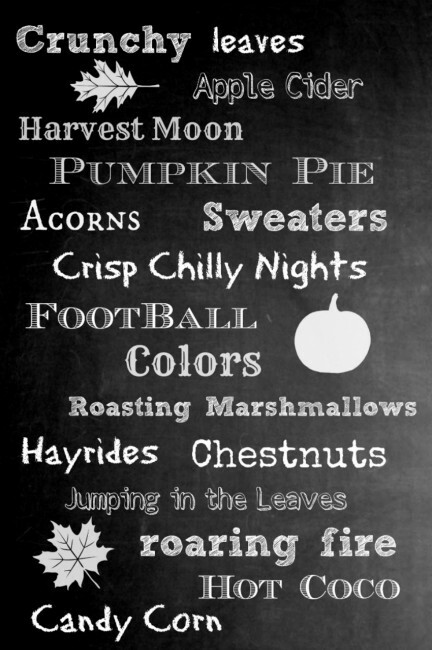 I have been trying to print your fall printable with no luck. It says my email is not noticed. I have been receiving your blogs for ~2 years. Help!! I want to give this to my mother-in-law to go with the white pumpkin centerpiece I bought her! Hi Bev. I’m sorry it took me so long to respond to you! Try this link instead: https://app.box.com/s/i9skkf3q8gjjw3hyztkd. It should work for you, but please let me know if it doesn’t! 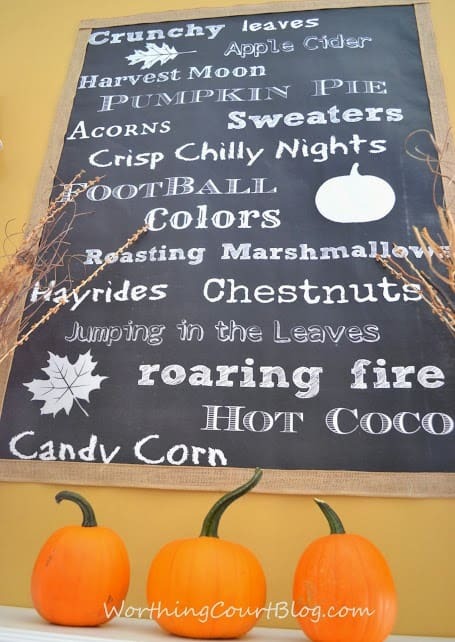 Fantastic chalkboard wordart! Thank you for sharing.